find ich elegant. Gefällt euch die Farbkombi auch? Den Prägefolder hab ich lang gesucht... in Sandras Bastelladen bin ich fündig geworden... und wie, lol. Thanks for playing in our "Monochromatic" Challenge #71! This is perfect for our current challenge “Monochromatic” at Pattie’s Creations. Thanks for joining us! So very pretty and elegant. Beautiful! Thanks for joining in the fun at Rhedd & Rosies. Very elegant! Thanks for playing along with the Bloggers Challenge! 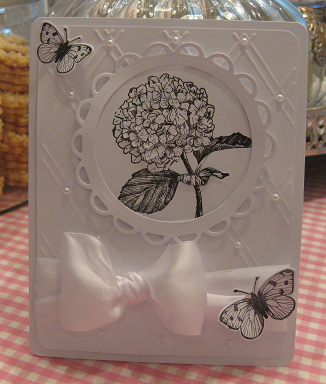 Such a beautiful card within its simplicity, you could have entered this into my Lady Anne's Challenge as it is Monochrome this month :-) Thank You for sharing with us at Lady Anne's Challenges. I hope we see you again soon. Now that's a beautiful card! Thanks for playing along with us.